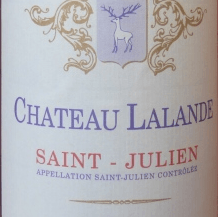 Chateau Lalande Saint Julien 2010. A wine that possesses all the richness and power that you should expect from a classed St Julien estate but at half the price. Textbook pencil lead, tea chest nose with a well structured palate of intense cassis fruit and fine grained tannins. destemmed and crushed and transfered to temperature controlled stainless steel tanks. Fermentation last around 10-15 days, with 7 days maceration.